Our Highland Secrets accessories uniquely compliment our kilts and other Scottish clothing. Each accessory is designed and made by Highland Secrets or selected to be the appropriate item to go with the style of each of our garments. 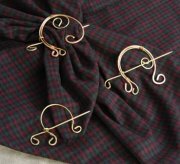 Hand made by Highland Secrets, from brass and copper, these unique and sturdy pins are used to hold together the plaid of the Great Kilt, or for any Arisaid, Ruana, Shawl or the like. They also are wonderful for a hair ornament! This attractive neck ornament for both gents and ladies, made by Highland Secrets, is constructed from copper and aluminum. This ancient styled accessory is a unique addition to any outfit.